A new date for the diary, a good chance to make a great Easter Holiday week-end with a day out for the family at Balcormo followed by Easter fun on Sunday. Changes in the planning include an enhanced hospitality offering and a new Novice Riders race on the programme, plus all the usual pony races and trade stands. 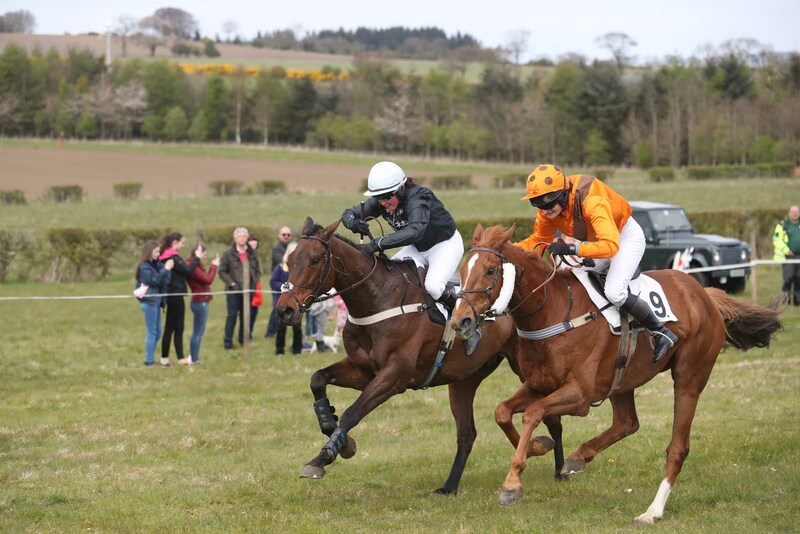 The annual Fife Foxhounds Point-to-Point fixture took place in glorious sunshine on perfect jumping ground at Balcormo Mains on Saturday and attracted one of the biggest crowds of the Northern Area season. A total of 35 runners faced the starter, the highest figure here since 2014. 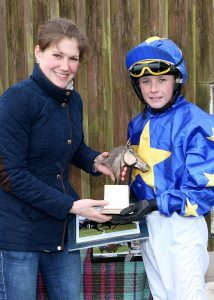 After taking her tally of winners for the 2017/18 National Hunt season to 46 following Thorpe’s victory in a £15,000 Perth Handicap Hurdle the previous day, Milnathort trainer, Lucinda Russell’s promising youngster Chanceiton made it 3 wins from 6 Pointing starts in the last five months in the Turcan Connell Fife Foxhounds and NPPA Conditions Race. After seeing all three runners at last week’s Perth Festival not beaten far when finishing in the first four, Molesden near Morpeth-based owner, Simon Waugh enjoyed better luck card at Balcormo where one of his recent acquisitions, Nicki’s Nipper landed the £1500 Pentland Land Rover Mixed Open Race-the most valuable Point-to-Point contest ever staged in Scotland. 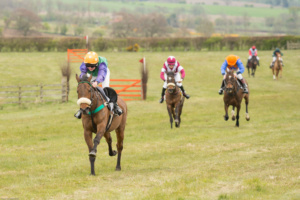 Given a positive ride by daughter, Amie, who also trains her, the 10 year old quickened up nicely on the downhill run to the second last and was left a few lengths clear when ex-chaser, Rolling Thunder, who was disputing the lead at the time, fell. Thomond tried hard to bridge the gap in the closing stages but was still three lengths down at the line. Haydon Bridge owner/trainer/jockey, Charlotte Tailford, 20, spent four weeks on the sidelines after breaking her collarbone in a fall from Exit Ten at Overton last month but the partnership made a winning comeback in the Strutt & Parker Restricted Race. Always up with the pace, the 7 year old stayed on well from two out to join Afterclass at the last before finding plenty when the chips were down to secure a half length verdict. Treliver Manor made it three victories on the day for Northumbrian raiders in the 8 runner Rae Grieve Memorial Open Maiden Race and, at the same time, provided Liam Ruddy, 18, with his first winner. After being sent on four out, the 10 year old looked set to cruise home as he entered the finishing straight with a clear advantage but had to dig deep to repel a late surge from the unfancied Royal Flush (Aaron Anderson) by half a length. The latter, home-bred by Simon Waugh, was foaled on 28 April 2011, 7 years ago to the day and his dam, Mystical Feelings made her debut in the corresponding Maiden Race at Balcormo in 2005. 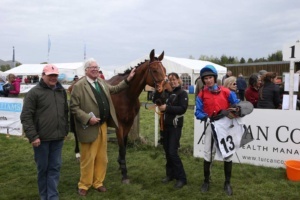 Good things come to those who wait as Lauder-based owner/trainer and farrier, Jock Threadgall ended a near five year drought with Tambour Major in the 9 runner 2m4f Rathbones PPORA Club Members Conditions Race. Given a peach of a ride by Connor Wood, 20, who is also based in the Dobbin yard, the 11 year old dictated a strong pace from the outset and galloped on relentlessly in the home straight to prevail by a length from the favourite, Nine Altars (Charlotte Dun). Unfortunately, the Bruce Farms Intermediate which had only 3 entries, including Chanceiton (NPPA Conditions Race winner) and Left Back (finished 3rd in Restricted Race) was a rare void contest, having received no declared runners-only the second time this has happened at a Northern Area meeting since 1982. 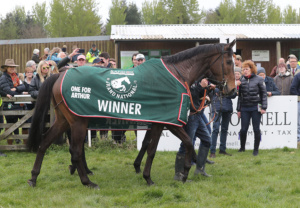 However, the Bruce Farms Bonus is still up for grabs as any runner on Saturday that goes on to win the Bruce Farms Hunters’ Chase at Perth on the evening of Wednesday 16th May will receive a £3000 bonus. As usual, the main action was preceded by three well contested pony races. The 6 runner Musselburgh Racecourse Treehouse Sporting Colours Novice Riders Race for ponies 148cm and under went to Milli Butterfly ridden by 12 year old Archie Parsons from Anstruther. His twin brother, Murray finished 2nd on Altered Images. A special mention also for 11 year old Benjamin Rogers who finished 5th on Boom Boom, having travelled all the way from Caithness. 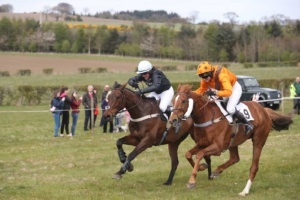 The 4 runner Open Race for ponies 138cm and under, sponsored by The Ship Inn, Elie, was won by Ravara Super Ted ridden by 10 year old Shay Farmer from Hawick. 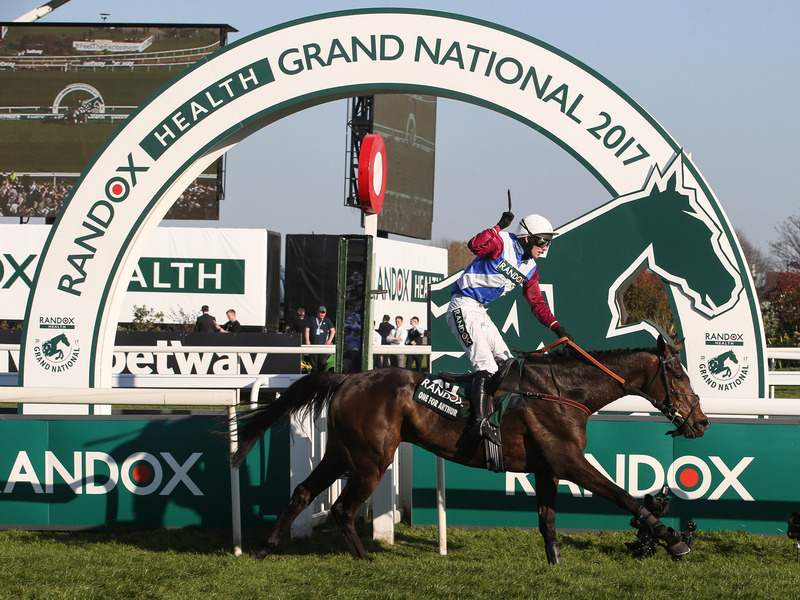 They were chased home by another long distance traveller, Merryment Top Cat ridden by 11 year old Thomas Bradburne, son of Hungerford-based former National Hunt jockey, Mark Bradburne. 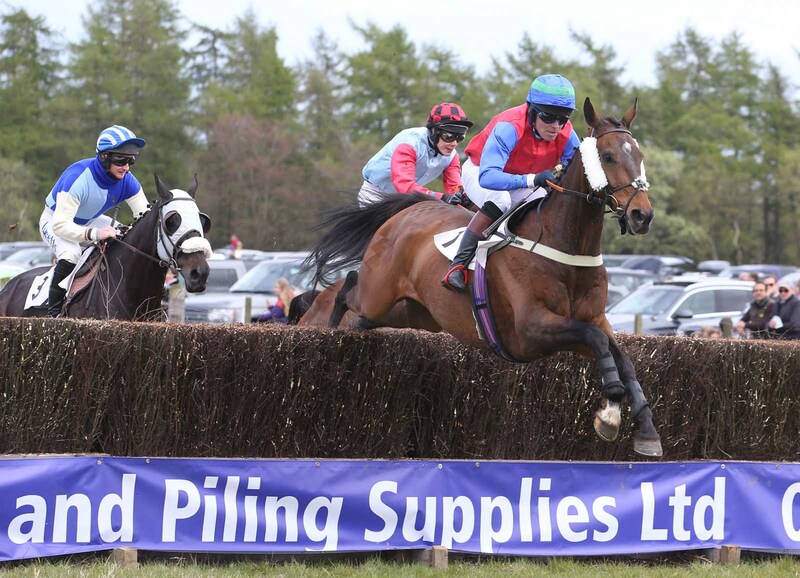 Sarah Longthorn (14) made the long journey from Hull worthwhile by winning the Perth Racecourse Open Race for ponies 148cm and under on Springs. Doppio Movimento (Nick Barratt-Atkin) finished runner-up with Rubyroo (Tara Stockwell) in third place. 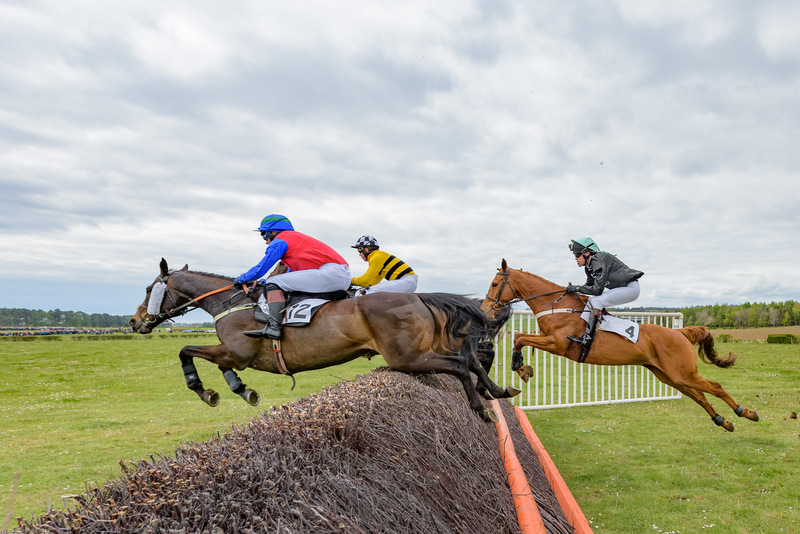 The Northern Area season continues on Sunday 6th May with the Lauderdale fixture at Mosshouses and it also includes two pony races. 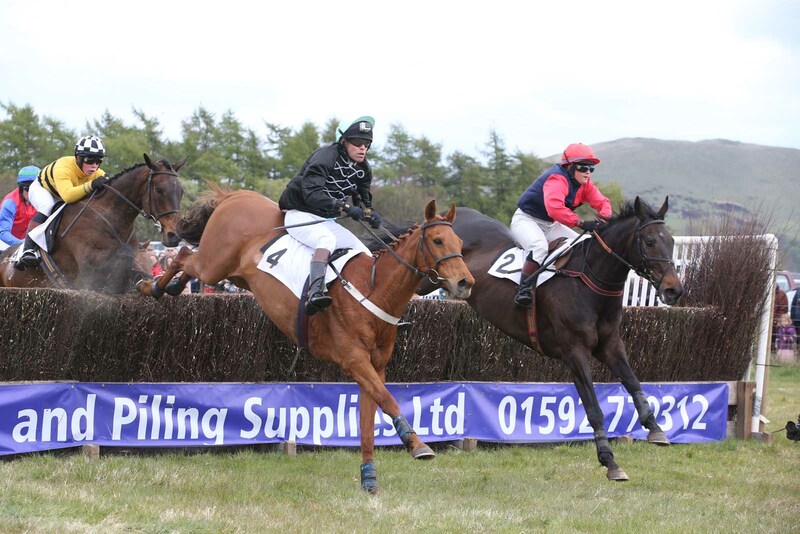 Royal Chatelier (nearside) ridden by Jamie Alexander, Nickwillis, Cameron Wade, the eventual winner with Great Gusto (Will Ramsay) on the right. Competitive Ladies Race, winner nearside Whisperdale, owned by Jack Clark, ridden by Charlotte Dunn, with Shantou Magic, ridden by Kelly Bryson, owned Will Ramsay. Doppio Moviment, Nick Barratt Atkin, pony race at Balcormo point-to-point on 29Apr2017. 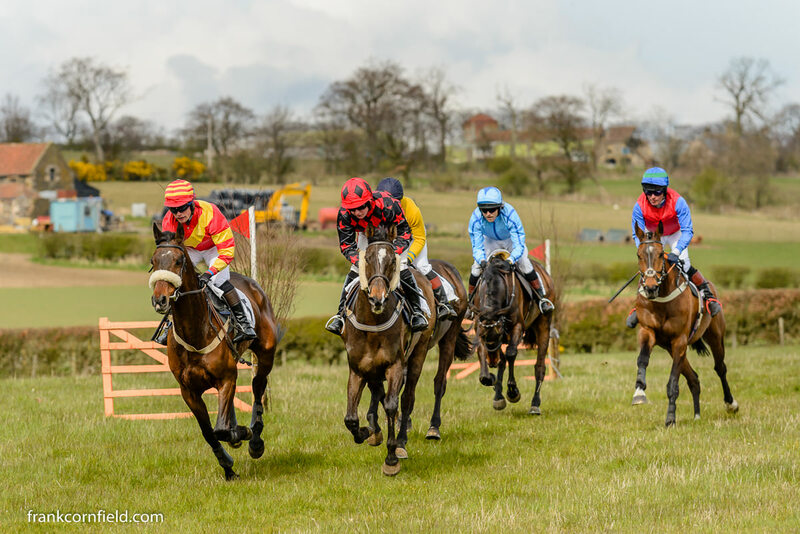 The Pentland Rover Mens Open Race at Balcormo Point-to-Point on 23 Apr 2016. Have One for Me (4th) is leading Supreme Regime (5th) with Oldrik (3rd) just behind, eventual second For a Finish in light blue followed by the winner All the Kings Horses waiting at the rear.